"I cannot help fearing that men may reach a point where they look on every new theory as a danger, every innovation as a toilsome trouble, every social advance as a first step towards revolution, and that they may absolutely refuse to move at all." Dear visitor, thanks for stopping by for getting some food for discussion about excessive consumption. September 2015 Have a look at this new documentary: "Landraub" by Kurt Langbein. July 2015 A new study of the effects of anthropogenic carbon dioxide emissions is published in Science. The lesson is clear: The oceans have reached their limit to withstand man-made climate change. 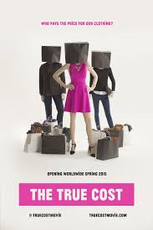 June 2015 The new documentary THE TRUE COST looks behind the concept of fast fashion. Director Andrew Morgan follows the exploited Bangladeshi garment worker Shima Akther who can see her little son only once a year. The movie shows the abyss of ignorance of Western shoppers towards the lives of those who produce their cheap clothes. You may want to look here. © 2015-2018 IMEB. The sites provide links to several third party websites. While we make effors to choose our links carefully, we cannot take responsibility for the content of linked websites.